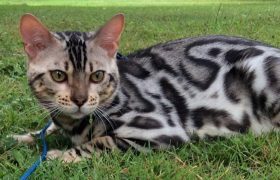 Many people ask me this question; Are Bengal Cats Hypoallergenic? I think some people believe that Hypoallergenic has the same meaning as “non-allergenic”. This is simply Not True! Hypoallergenic means that Bengals are “less likely” to cause an allergic reaction. It is always a wise decision to contact your doctor or allergist before considering a Bengal cat. This is especially true if your allergies cause breathing problems. Breathing is serious stuff! You may also want to visit a friend or relative who has just one or two Bengal cats. This will give you a good idea how you will react in a controlled environment. It is not recommended to visit a Bengal Cat breeder, however, to make this determination. This is because most Bengal breeders will have many more cats than you will ever be exposed to in your home setting. For that reason it does not make a breeder’s home a fair way to rate your allergic reaction. In talking to people who have cat allergies some tell me they are also more allergic to unaltered cats than they are to a cat that has been spayed/neutered. Some tell me they are more allergic to males than females or vise versa. Whatever the case you must take purchasing a Bengal cat or any pet very seriously so you don’t get ill or make it necessary to rehome him or her. One thing that absolutely IS true is that Bengals shed much less than other cats. Usually a weekly brushing with a soft bristle brush or rubber type brush is all it takes to keep their coat healthy and shiny.